Hayley Chang is the Deputy General Counsel of the U.S. Department of Homeland Security. In this capacity, she advises the Secretary on cybersecurity strategy and the Department’s unique legal authorities for engaging the private sector in preparedness and incident response. 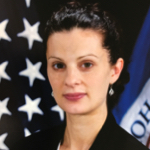 Ms. Chang also oversees the legal teams for cybersecurity operations, intelligence, and infrastructure protection. Ms. Chang previously served as Counsel to the Deputy Attorney General on national security matters, where she chaired the Department of Justice’s information-sharing task force, and Deputy Rule of Law Coordinator for the U.S. Embassy in Baghdad, Iraq. Ms. Chang also previously served as a federal prosecutor, where she investigated and tried a variety of white collar and complex criminal cases. In the private sector, her practice focused on government investigations and class action litigation. Ms. Chang graduated from Cornell Law School, where she was an editor of the Cornell Law Review and clerked on the U.S. Court of Appeals for the Tenth Circuit.